Flowers may only stick around for a week or two, but bricks last a lifetime. 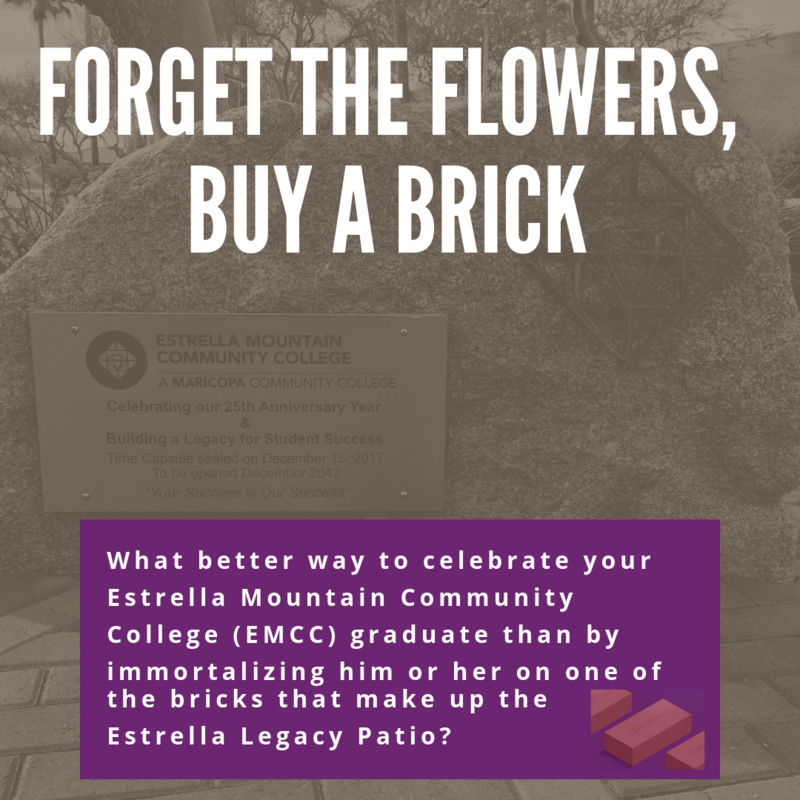 And what better way to celebrate your Estrella Mountain Community College (EMCC) graduate than by immortalizing him or her on one of the bricks that make up the Estrella Legacy Patio? The patio, which is just east of Plaza Gallery, was installed in 2017 in celebration of EMCC’s 25th anniversary. It is built in the shape of the school’s logo — a diamond. A time capsule is buried at the tip of the diamond just in front of a commemorative stone. The patio started as a blank slate, but through the college’s Buy a Brick, Build a Legacy campaign, bricks now bear names and special messages. Imagine inspiring future college students in your family with something they could walk by every day as they embark on their own EMCC journey. But wait, it gets better. Your contribution will also help the dreams of future EMCC students come true. Proceeds from the brick sales go to the Accelerating College Completion through Endowment Scholarship Support (ACCESS) fund, which falls under EMCC’s Title V grant, a federal grant awarded to Hispanic-Serving Institutions. And that’s not all. Every dollar donated to the fund is matched by the U.S. Department of Education! EMCC estimates that a $300 donation pays for a three-credit class with books, a $750 donation pays for a part-time student’s tuition and books, and a $1,250 donation pays for a full-time student’s tuition and books. “For a lot of our students, being able to pay for college is a big determining factor of whether they can go and achieve their career and academic goals,” said Jonathan Robles, EMCC Alumni, Corporate & Foundation Relations Director. Bricks measuring 4 inches by 8 inches start at $125 for one line of text 18 characters long. The same brick containing two lines with 18 characters each runs $250, and one with three lines, 18 characters each costs $500. Bricks measuring 9-by-9, commemorative stones/benches with naming plates, and replica bricks in display cases with commemorative naming plates are also available through the campaign. Maricopa Community Colleges employees are eligible to purchase bricks through the employee pledge form option via payroll deduction, spacing their payments out over one to three years. 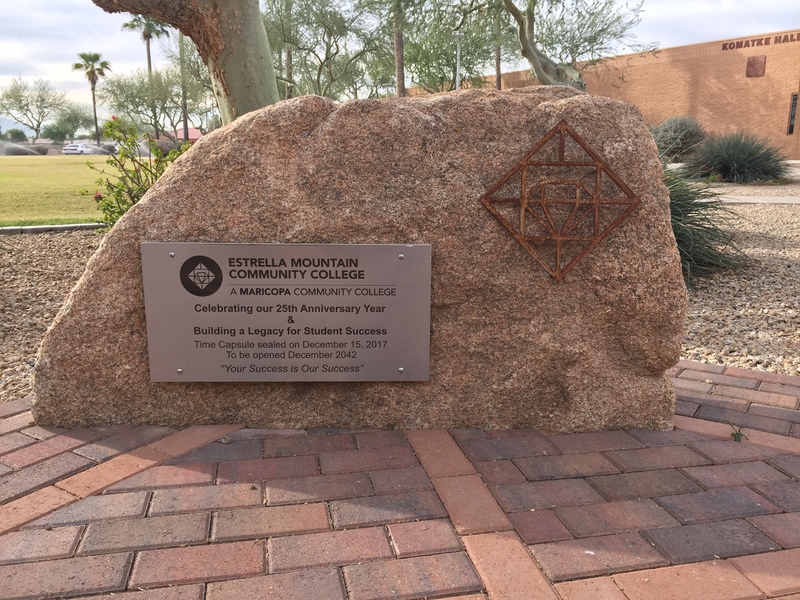 For more information on the program and to purchase a brick, visit https://www.estrellamountain.edu/giving/build-a-legacy.